The Next Northern Challenge: The Reality of the Provincial North, MacDonald-Laurier Institute, 2014, with Greg Poelzer. An Unfinished Nation: Completing the devolution revolution in Canada’s North, MacDonald-Laurier Institute, 2014, with Greg Poelzer. The Way Out: New thinking about Aboriginal engagement and energy infrastructure to the West Coast, Part 3 of the Aboriginal Canada and the Natural Resource Economy Series, Macdonald-Laurier Institute, 2013, with Brian Lee Crowley. 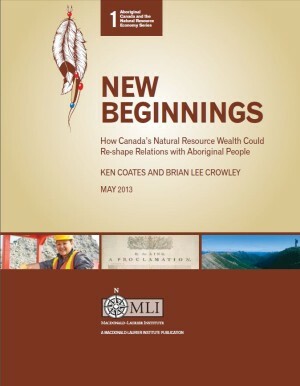 New Beginnings: How Canada’s Natural Resource Wealth Could Re-shape Relations with Aboriginal People, Part 1 of the Aboriginal Canada and the Natural Resource Economy Series, Macdonald-Laurier Institute, 2013, with Brian Lee Crowley. Governance and Northern Canada, Macdonald-Laurier Institute, 2012, with Greg Poelzer. Evaluating Telehealth `Solutions:’ A Review and Synthesis of the Telehealth Evaluation (submitted to Office of Health and the Information Highway, 2000). With Gerald McCarthy and Richard Scott. International Perspectives in Maori Land Rights and Claims (Wellington: Public Law Office, 1997). Hardly A Grand Design: Aboriginal Resettlement in the Yukon Territory After World War II. (Ottawa: Royal Commission on Aboriginal Peoples, 1997). Available on For Seven Generations: An Information Legacy of the Royal Commission on Aboriginal Peoples (CD-ROM). Aboriginal Peoples and Government in the Canadian North: The Yukon Government and Yukon First Nations–Examining an Evolving Relationship, (Ottawa: Royal Commission on Aboriginal Peoples, 1997) Available on For Seven Generations: An Information Legacy of the Royal Commission on Aboriginal Peoples (CD-ROM). Social and Economic Impacts of Aboriginal Land Claims Settlements: A Case Study Analysis: A Summary Report. British Columbia. Ministry of Aboriginal Affairs, 1995. Inventory of Archival Materials in Western Manitoba, 3 vols. (Brandon: Brandon University Press, 1989). With John Everitt and W.R. Morrison. 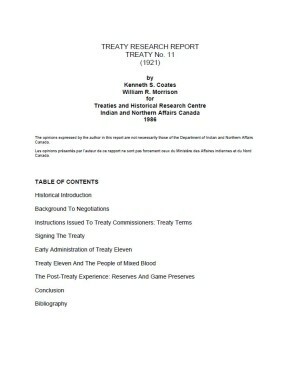 Treaty Number Eleven (Ottawa: Treaties and Historical Research Centre, 1987). With W.R. Morrison. 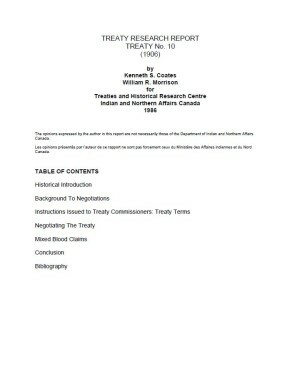 Treaty Number Ten (Ottawa: Treaties and Historical Research Centre, 1987). With W.R. Morrison. 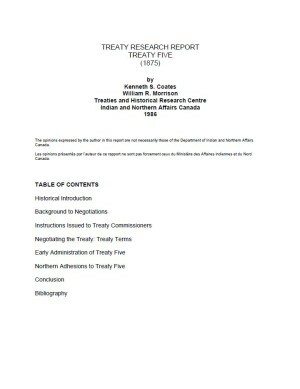 Treaty Number Five (Ottawa: Treaties and Historical Research Centre, 1987). With W.R. Morrison. The Northern Yukon: A History. Manuscript Report No. 403 (Ottawa: Parks Canada, 1979).